Treat your loved one with a gift voucher from China Blue Shoes, which can be used online or in-store. You can choose a gift voucher for any amount from €20 to €250. Click the link below to purchase a gift voucher which will be sent by email. To redeem your gift voucher you will need your 8 digit voucher code. If you received your gift voucher by email you will find the code in the email. If you have a physical gift voucher the code will be written on the voucher. 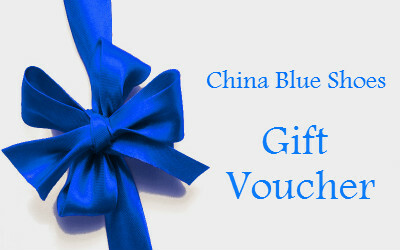 You can redeem your gift voucher online at chinablueshoes.com. First add the products you wish to purchase to your shopping cart. Then when you get to the Shopping Cart page you will see a Gift Voucher section. Enter your voucher code in the box and click Add Gift Voucher. The amount on the voucher will be taken off your order total. If the order total is more than the value on the voucher you can pay the remainder as normal by credit card or paypal. If the order total is less than the value on the voucher, then the remaining balance will stay on your voucher which can be used for a future purchase. You can also use your gift voucher in our Dublin city centre store, which is located at Merchants Arch in Temple Bar (see map). Simply bring your voucher code with you and give it to the sales assistant when making your purchase. 1. Gift Vouchers are valid for 2 years from the date of issue. 2. Gift Vouchers are non refundable and can not be exchanged for cash. 3. If the full value of the voucher is not used in one transaction, the balance will remain on the voucher which can be used in future transactions. 4. Gift Vouchers will be subject to verification at time of presentation. 5. Lost or stolen gift vouchers will not be replaced. 6. In the event of any dispute the decision of China Blue Shoes is final. 7. We reserve the right to vary these terms & conditions.